My bucket list has a big new checkmark on it. Got to see Michael Schenker the other night, in a nice upscale club that’s part of the Patriot complex in Foxboro. Nice enough venue, but a bit small for MSG at considerable volume. Although somewhat the worse for wear and not quite as thin as Johhny Winter, Michael’s playing has only improved with time. And he was pretty freaking scary to begin with. There have been several versions of MSG over the years, with many personnel changes; I was hoping for Simon Philips on drums and Graham Bonnet lead singing. This tour includes Gary Barden singing and Carmine Appice on drums. Not so bad, save for Appice’s overly long and tedious drum solo, which I presumed was written into his contract. Dinosaurs R’Us. This is a 30th anniversary tour. I had to get out my abacus and make sure that the sundial was positioned just so; but damned if the math doesn’t add up. And I still have never gotten through ‘ Into the Arena’ even once without dropping the ball. But I still have time…right?? In anticipation of this event, I ran some MSG stuff through the old Nakamichi the other day, and found some appalling inconsistencies; mainly, an absolute lack of low end in the final mix. The conventional wisdom of the time said that if you gutted the lows from heavy rock, then you might get some radio airplay. Michael was produced then by Roger Glover of Deep Purple fame, and he really took that to heart. Too bad. ‘ Somebody’ ought to remix all that stuff and put the juice back in. While standing in the crowd, it occurred to me again, as it has in the past, why this music needs to be loud. It needs to hit you in the chest and knock you back four feet. That is a huge factor in its effectiveness, and if you take that away, then you ultimately forget what the point ever was. It took the sound techs about four songs in to get everything balanced. Loud is very uncomfortable if it’s not done properly, and people hate that. Nobody likes noise. This was loud and clean. Also occurred to me as to why there have been so many changes in MSG. You wouldn’t notice unless you saw them live. There’s Michael being Michael, and everyone else is a sideman. That’s an odd dynamic for a rock band. Singers especially would hate that. So there’s been a busload of personnel changes, because they can’t handle the truth. There’s only Michael/ not Michael. Well…after several attempts at a coherent post, here it is Monday morning; and I find myself in much the same frame of mind as last week. Undecided about where to proceed with the Leadville saga; whether to cap it as a short story, or leave it as is on the premise that it may yet make the turn into a novel. This is intriguing to me personally, because I had started a work of my own a few years back, and essentially the same thing happened. It will stay as it is for now. No need for undue haste. ‘ Leadville’ could possibly be critiqued as is, and I’ve been poking around with writer’s workshop sites that will do just that, in exchange for my reviews of other’s works. Very curious as to how it might read to an unbiased bystander. Scary. So. I will leave it as is. It may yet be worked on again, so it remains untouched. Have to wait to see if it begins to’ glow’ again, indicating an idea that just can’t wait to be attended to. If you can remember the old bit from Star Trek the Ancient TV Series where someone being beamed to somewhere else begins to glow in that tingly sort of way…it’s like that. Sort of. The thing justs starts to write itself somehow, and you’re just holding on to the coattails. Time will tell. In the meantime…a new idea for a collaboration may magically present itself. The only rule that would stand is the’ multiple-of fifty words’ rule. All else is fluid. No restrictions or constraints; we’ll just see what works and what doesn’t, as we go. ( We already know, to some extent.) So if you should notice any ideas lying around that suddenly seem like they’re about to be beamed to another planet, see if you can’t redirect them here to the Rag. Just leave a description of the idea as a comment, or email me at Cpt21Miss@aol.com. 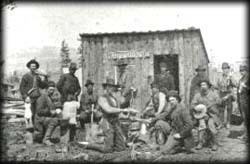 Thanks to all who contributed to the Leadville project, and especially to DS1 for a nicely done short-story ending; and should you stay on for comments/posts, you would be the only other Rag denizen with an actual pulse. The Opera House is awash with speculation. Ramifications. They’re everywhere. All over the damn place. – Which direction on Rt. 24 are Jimmy and Wanda going in? Huge. -Is Office Stanton still with us? If so, what did he see? Also huge. DS1 surprised the hell out of me again. Twice, no less. Once, with Scott getting the gun; and again, with Wanda getting the gun. And Clark got me the other day. You look at a scenario and think that there aren’t that many variations on where it might go. Wow. Damn. Jeez. What? Come on! Wait! Who? It’s fun, actually, in that terrifying kind of way. And in a relatively short time, the probable direction of this thing has changed drastically. So… the bike drives off in the distance; and this seems like a good time to call it a chapter, take a deep breath, and possibly re-direct. The next entry will start Chapter Three. We could follow the bike, look back in town, focus on the road scene, check with the bad guys…or something entirely unexpected that will have my damned mouth hanging open…again. What? No way! How? Are you freaking kidding me? When engaged in creative writing, one must ( or at least should ) consider them carefully. The overview is so vitally important that you cannot well afford to ignore it. I’ve already done a few edits on my own piece from yesterday, and have spent more time than I should reading up on SOP manuals from the Denver Police ( very comprehensive). The State Police don’t seem to have much online. I had to change the officer’s sidearm to the current Smith and Wesson upgrade ( minor ), and had to rewrite his keying a lapel mike to the ‘on ‘ position as he approached the car ( major). That’s not going to happen in real life; that would prevent his receiving transmissions as well. Logical. The SOPs stress proceeding as safely and as logically as possible. All this because Chelsea had to go and shoot herself. ” Don’t blame me” she pipes up. ” Damned writers. And now that you mention it; if I just shot myself and I’m dead, would the head wound still be pulsating? Who are you, Dr. House, now? Let me shoot you in the head, and we’ll test that theory. How about you stick to writing what you know for a change, like…oh, I don’t know…how about a carful of self-centered guitar players getting pulled over by a state trooper for speeding? ” Gee, we’re really sorry. Doing 90, you say? But we have a case of Blue Moon, and you know that you just have to have a wedge of orange with that, so we ‘re going to the 24-hr Safeway in Aurora, and if you’ll just let us go, then we’ll never ever do it again, but we just have to get the oranges, and then back to Leadville for a sound check at the Opera House, and we’re so hungry, and I need a 12-volt power supply for my new rack processor, so then to Radio Shack, it’s the new Eleven Rack, it’s so awesome, and I have to change string gauges on my Les Paul because of the elevation around here, and… what? Proof of insurance? We don’t have no stinking proof of insurance…ask the bass player, he’s in the car that was behind us…why? Do I have to step out of the vehicle? We’ll be late now…can’t you just pretend that I did, and here’s two bottles of Blue Moon and we’ll call it a day? No? But why not? And suddenly shots rings out. Even Officer Stanton has his limits. That’s a line from Roland’s benefactor and creator, Warren Zevon. He thought it most appropriate. That got a decent laugh. A very brisk morning at the Opera House, with three unexpected visitors; Catherine Howard, the Countess of Salisbury, and our own Chelsea. Catherine and the Countess are just happy to have a new place to hang out. Anything to get out of the damned Tower for a change; and they thought a visit with Anne and Mary a capital idea. They say that Henry has become quite the bore with his constant clamoring for attention, as if he were the only ghost in the place; they say that he’s actually miffed at having to haunt the Tower, rather than Whitehall. Not nearly as comfortable. Frontier justice, says Doc. Their main topic of conversation? Street cred, or rather…platform cred. Anne was a quick one-stroke. Clean, no complaining. 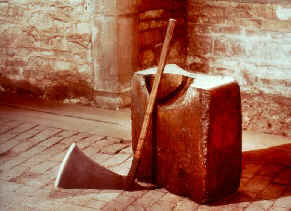 Mary was a three-stroke; and she tipped the axeman nicely, too. Catherine was absolutely terrified, but racked up huge points by asking for the block in her chamber the night before, so she could practice being graceful. Style was all with Catherine. And they finished by holding her head up so she could see her own decapitated body. At age 68, she kicked and clawed and bit. They had to hold her down, and the stroke got her in the shoulder. At which point she broke free; and they had to chase her about the platform and down the stairs. Even then, it took eleven strokes to complete. Massive credibility. A hushed silence, and then wild applause. In closing, all the ladies agreed; never underestimate the English capacity for genius in cruelty. And Paul Pierce thought that Dwight Howard was bad. Phht. Leadville at 0800; 48F, high of 76F. Partly cloudy. Hard to believe for New Englanders sitting in the humid 90’s and torrential rain. So far, it seems that the biggest challenge in this novel-writing business is to keep the characters in line with the Big Picture. They seem in constant danger of becoming their own little soap opera that has nothing in particular to do with their immediate surroundings. Not a criticism, per se; they do have to be allowed to develop on their own. Perfectly valid. But if a way isn’t found soon to make that link, then we’re in danger of two separate storylines running side-by-each ( RI dialect ) that never meet up. In the world of real writers, this is likely one of the differences between an OK writer and someone with a very advanced skillset. We have to fix this. I think I can see a way out. Chelsea may go over to the dark side. Maybe she was there already and we haven’t noticed. Maybe it has to do with Jimmy taking off on her. Maybe it’s all tied to the bad guys in the hills. Remember, the floor is open. If anyone sees a good path, take it. Doc thinks she’s got a pepperbox. Roland is betting on a Colt Cobra or a Walther PPK. Bach says not to pre-judge, she’s got a shoulder bag, and she could have God knows what in there. What, they all ask, is a Blackberry? P.S. – Doc admonishes me to remember my manners, and thank DS1 and Clark for their recent entries. 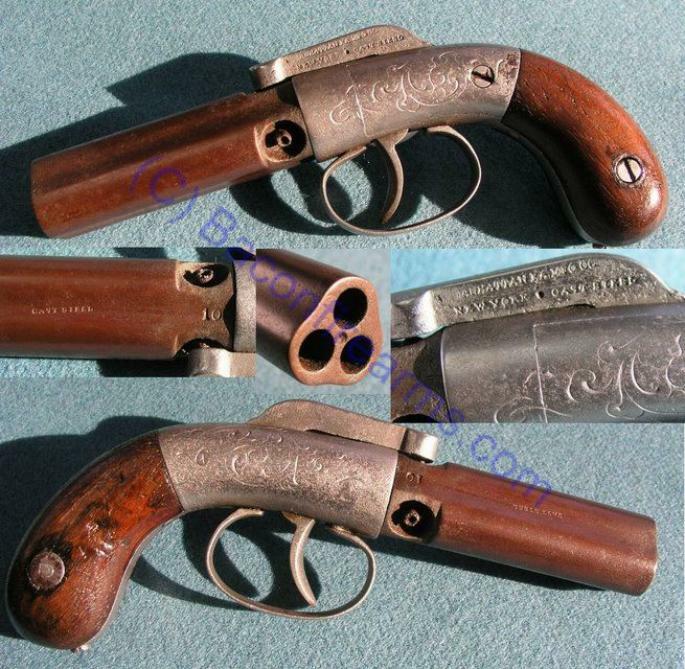 Or he’ll pepperbox me. Well, it’s official. The Rag’s digital residents have relocated to the Tabor Opera House in Leadville, CO. Everyone thought it a good idea to stay nearby the scene of the action in the novel next door. Apparently a very busy weekend in Leadville; there was a rodeo, a tour of the Opera House, and even a concert later in the evening; some local-hero folksinger guy. The Rag collective found him quite entertaining, and Bach of course kept insisting that his rules of harmony are being strictly adhered to. And just a few nights before their arrival, a troupe of Denver Ghost Hunters were about the place. Queens Anne and Mary say not to worry about all that; they’ve been chased by ghost hunters for years, and all you need do is drain the power from their camera batteries. That pretty well keeps them under control. Tap on the wall a few times, and they’ll be out of there in no time. Just wanted to give a quick welcome to a few new readers, and a short explanation of how this blog is set up; should help to alleviate initial confusion. This is a two-column blog. One column is comprised of Posts, which is what you’re reading right now. The other column consists of the Work Area, where you and everyone else on the planet is invited to assist in the writing of a collaborative novel. The work is well under way, and so far we have offerings from four writers, myself included. You are certainly encouraged and welcome to take part. There are rules involved; they are posted in the ” About the Rag” footnote. Current additions are submitted as comments in Work Area #2, under reply. To mention one curiosity for the sake of new readers; Posts are listed in reverse order. The most current one is what you’ll see when you first check in; the first one ever is at the very bottom of the list.This makes it a bit harder for the reader if I use Posts to tell a concurrent theme or story ( as I am currently), because the entries appear backwards. 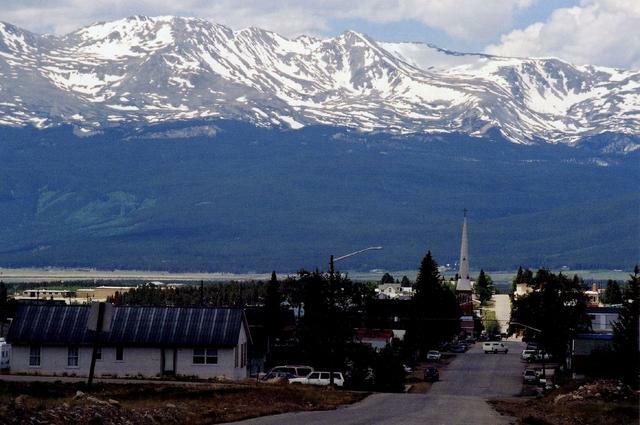 I am currently using the Post area to highlight the town of Leadville CO, where the novel that is being written takes place. So… the Post area runs alongside of the Work area ( where the novel is ). The Posts are written solely by me and are generally likely to support the novel as it goes along. ( This explains why the Opera House in Leadville is about to be inhabited by a motley crue of interesting dead people). Posts are like my own personal finger-painting area; good fun and good therapy. You are also welcome to reply to any post in the way of a comment. Always good to get feedback. Go ahead and be critical if you like; I’ll just ask Doc and Roland to go out and discuss it with you. ( See? That is an example of a teaser, and now you’re supposed to go back through the posts to find out who the hell they are, and what that even means). I reserve the right to make up terminology as I go along; that’s one of the benefits of being the Editor. So, welcome again, and thanks for your patronage. And please consider getting involved in the writing; there is nothing quite as terrifying as writing something and hitting the “submit” button for the first time, knowing that your words are smeared across eternity for …well, eternity. ( Unless, of course, you ask me to edit something out). Leadville at 0700 hrs; 39 degrees F.
Doc’s tour was a rousing success. 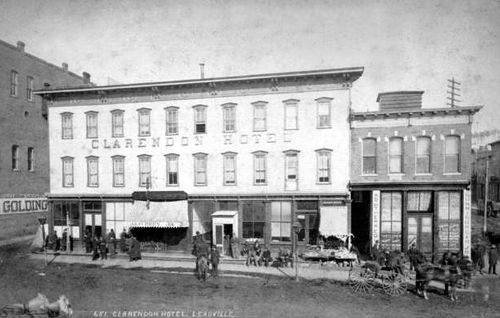 After repast at the Delaware, the entourage proceeded to Harrison and 7th, for drinks at the Clarendon Hotel. To his dismay, they found the Clarendon to be no longer in existence; much like themselves. It had been demolished in the 1930’s. Doc recalls having encountered many notable persona there, including Oscar Wilde, US Grant, and Billy Sherman; although he remembers that as being a coldly formal and terse conversation, with him being a native Georgian. The legendary walkway between the hotel and the Opera House next door was of keen interest to Queens Anne and Mary; anything to keep from the chaotic environment on the streets. The group wholeheartedly voted to hold regular concourse at the Opera House, walkway or no; as it only hosts the occasional show or troupe of tourists nowadays. And since they don’t exist in the technical sense, they won’t be much of a bother at all. So…nemine contradicente. 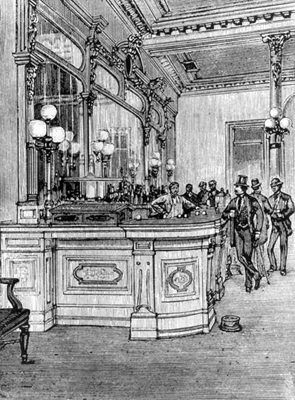 After a brief stop at the old Hyman’s and a breathless re-telling of Doc’s last gunfight, the tour concluded with bowls of coffee. Tomorrow, all will pack up for the official move to the Opera House.